Set up auto-linking in your course to make it easy for your students to find activities and resources that you reference in textboxes (labels, forum prompts, assignment descriptions, etc.). With auto-linking activated, any time you enter the exact name of an existing activity or resource, Moodle will automatically link that text to the item itself. The example below shows how mentioning an activity in a label created a link to the activity. To activate auto-linking in your course, click on the admin gear and select Filters. Select On from the pull-down menu associated with the Activity names auto-linking option. Save changes. You may wish to disconnect auto-linking from quiz questions so that students cannot leave the quiz canvas to access course materials. Each activity that we create in our courses has its own filter settings, making it possible to adjust these links. 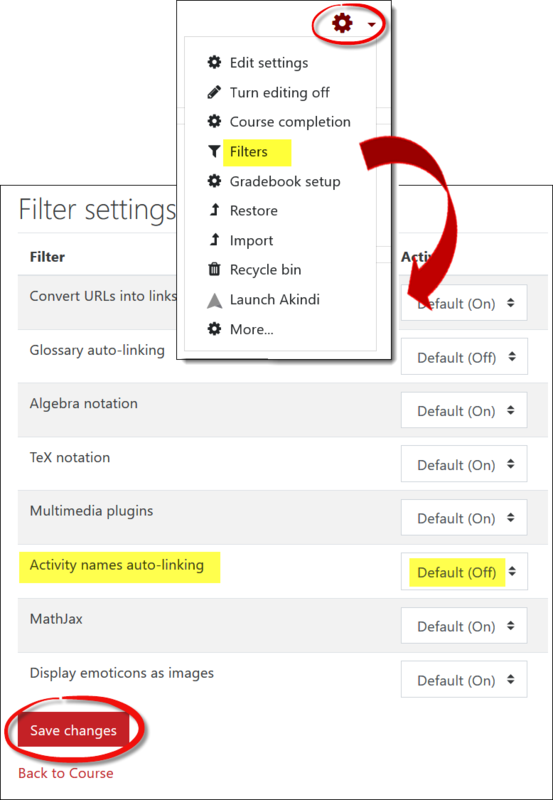 To disconnect auto-linking, open the admin gear associated with the activity, and click on Filters. Adjust the auto-linking settings as needed. 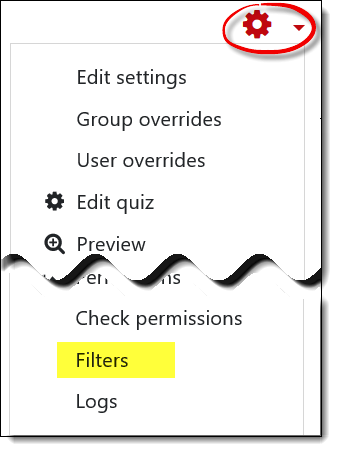 The example below illustrates the Filters link in a quiz admin menu.